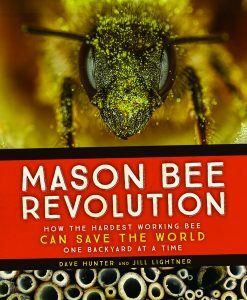 For gardeners curious about mason bees or building pollinator havens in general, Mason Bee Revolution is a lovely new book from Dave Hunter and Jill Lightner. The passion that the authors have for the topic at hand is infectious. Why keep mason bees? Compared to honey bees, it turns out that these pollinators are lower-maintenance, cheaper, and will pollinate more plants per insect than honey bees. They are also docile and child-friendly. This book is filled with small projects, practical how-to information, and suggested resources from the home beekeeper. The real strength of this book is the practical, easy-to-follow instructions about setting up nesting sites and habitat for mason bees and leafcutter bees. Materials, site requirements, harvesting cocoons, and over-winter storage are all topics that the authors address. There is a lot of information, but it is easy to follow. Although the book is 154 pages there are points when the narrative meanders slightly, and there is occasional repetition. The Bee-Friendly Garden is a wonderful companion to Mason Bee Revolution, and vice versa. This new book from Kate Frey and Gretchen LeBuhn introduces the reader to pollinator-friendly garden design and plant selection in a broader sense. 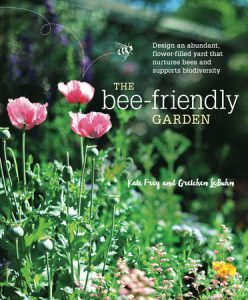 With six chapters the authors discuss a variety of bee species and genera, suggest a good number of plants for the home garden (including edible plants), address the basics of bee care and bee-friendly garden design, and finish with a mention of bee activism. (Mason Bee Revolution also addresses activism.) A good resource in general, The Bee-Friendly Garden is especially useful for deciding what plants might be appropriate for a pollinator garden. From an aesthetic standpoint, it is also a beautiful book. The photographs of different species of bees in particular are exquisite. With Mason Bee Revolution and The Bee-Friendly Garden in hand, backyard beekeeping can become a reality, and not just a far-fetched dream. Even for those with limited greenspace to call their own, learning about native pollinators, pollinator-friendly spaces, and the activism that surrounds these interests is both intellectually stimulating and inspiring.